Blind Guardian is a German power metal band formed in 1984 in Krefeld, West Germany. They are often credited as one of the seminal and most influential bands in the power metal and speed metal subgenres. Ten musicians have been a part of the band's line-up in its history, which has consisted of singer Hansi Kürsch, guitarists André Olbrich and Marcus Siepen, and drummer Frederik Ehmke since 2005. Blind Guardian is a part of the German heavy metal scene that emerged in the mid-1980s. The band was formed in 1984 as Lucifer's Heritage by Kürsch (then also bass guitarist), Olbrich, other guitarist Markus Dörk and drummer Thomas Stauch. Dörk and Stauch both left the following year, and were replaced by Christof Theißen and Hans-Peter Frey respectively, who left as well before the end of the year. In 1987, Siepen joined and Stauch returned; under this line-up, which lasted 18 years (the longest in the band's history), the band changed their name to Blind Guardian and released their first album, Battalions of Fear, in 1988. Over the releases, Blind Guardian established themselves as a notable successful band and as pioneers of the power metal movement. In 1996, Kürsch stopped acting as the band's bass guitarist to focus on vocals. Various session members replaced him, mainly Oliver Holzwarth. However, in 2005, Stauch left the band, disapproving of Blind Guardian's transition into a more complex progressive sound with a heavy use of backing vocals, and was replaced by Ehmke. Most of Blind Guardian's albums were well received by fans and critics alike: Somewhere Far Beyond (1992), Imaginations from the Other Side (1995), and Nightfall in Middle-Earth (1998), are especially seen as influential works. The music is mostly composed by Kürsch and Olbrich together, and the lyrics, written by Kürsch, are mostly inspired by the fiction of fantasy authors such as J. R. R. Tolkien, Michael Moorcock, and Robert Jordan, as well as traditional legends and epics. Over the years a theme has developed which personifies the band members as travelling storytellers, leading fans to refer to the band affectionately as "The Bards". Blind Guardian was formed in 1984 in Krefeld, Germany, by Hansi Kürsch (vocals, bass) and Andre Olbrich (guitar) under the name Lucifer's Heritage, with Markus Dörk (guitar) and Thomen Stauch (drums). The band briefly expanded into a quintet with the addition of a second lead vocalist, Thomas Kelleners. However, after three months Kelleners left the band in a mutual agreement. Lucifer's Heritage first released two demos in 1985 and 1986, despite undergoing chaotic lineup changes: Dörk and Stauch were replaced by Christof Theißen and Hans-Peter Frey, respectively. Finally, in 1987, Marcus Siepen joined and Thomen came back to form the lineup which would stay consistent for the next 18 years. After Lucifer's Heritage signed a contract with No Remorse Records, the band changed their name to Blind Guardian to avoid any speculations about Satanism (in a bio it was stated that they also wanted to distance themselves from the black metal movement, as their demos were placed in with black metal albums at local record shops). The band's new name was inspired by the Fates Warning album Awaken the Guardian. They released their debut album Battalions of Fear in 1988, which was essentially a speed metal album heavily influenced by Helloween. These two German bands had close ties, and Helloween founder Kai Hansen made a guest appearance on Blind Guardian's second LP, Follow the Blind (1989), where the band revealed some thrash metal influence. Their third LP, Tales from the Twilight World (1990), had a much more melodic and "epic" feeling, with usage of choir and classical music influence. Blind Guardian signed with Virgin Records in 1991, and released their fourth studio album Somewhere Far Beyond in 1992 and the live album Tokyo Tales in 1993. Flemming Rasmussen, former Metallica producer, began working with the band in 1994, producing their fifth studio album Imaginations from the Other Side, released in 1995, and The Forgotten Tales, an album that contained half covers and half original work, released in 1996. In 1998, Blind Guardian released their epic album Nightfall in Middle-Earth. "Complete with anthemic choruses, spoken word story lines, and plenty of bombastic power metal punctuating every dramatic turn", says Allmusic's Vincent Jeffries, "Nightfall in Middle-Earth is perhaps Blind Guardian's most triumphant". A concept album based on J. R. R. Tolkien's The Silmarillion, Blind Guardian's music demonstrated some folk rock influence, but also featured heavy use of Queen-style layered backing vocals. Since Nightfall, bass guitar has been played by sessional member Oliver Holzwarth, and Hansi has been able to devote all his attention to singing. Nightfall was also the last Blind Guardian album produced by Rasmussen. A Night at the Opera, named after the Queen album, was released four years later. On this album, the band's sound lacked almost all influence of their original speed metal. Power and progressive metal abound, with over the top orchestral backing and a consistent vocal and guitar layering throughout. Though not a true concept album, many of the lyrics dealt with the common themes of religion and relations between human and divine powers. It was followed by a live album in 2003 and a DVD, Imaginations Through the Looking Glass, in 2004, which was the last recorded Blind Guardian material to feature Thomen Stauch on drums. He left the band due to musical differences and was replaced by Frederik Ehmke. The first album with Ehmke was A Twist in the Myth, which came out in 2006. Blind Guardian participated in the soundtrack for the In the Name of the King: a Dungeon Siege Tale fantasy movie (Uwe Boll), which came out in 2008. The band also recorded a theme song for Sacred 2 Fallen Angel role-playing video game, the sequel to Sacred. "A Voice in the Dark" was the next single from Blind Guardian, released on 25 June 2010. On 30 July 2010 the album followed, called At the Edge of Time. The band started "The Sacred Worlds and Songs Divine Tour 2010", the European dates featured the opening acts Enforcer and Steelwing. The US dates had Holy Grail and Seven Kingdoms and later they were announced that they would play at Wacken Open Air in 2011. On 21 July 2011 Hansi Kürsch announced on Blind Guardian's official website that they were working on an orchestral album. On 1 September 2011 Oliver Holzwarth joined Rhapsody of Fire as a full-time member, after 13 years as Blind Guardian's session bass player. On 27 January 2012 the band released a compilation album, titled Memories of a Time to Come, containing re-recorded and remixed songs from the band's entire discography, and almost exactly year later, on 28 January 2013, they released a box set called A Traveler's Guide to Space and Time, which contained all of the bands' studio, live and compilation albums released from 1988 to 2004, as well as some previously unreleased material. On 11 July 2012 Hansi posted on the bands' official website that the band would cease touring after their show at the Rockharz festival in Ballenstedt, which happened two days after the post. Hansi went on in the post to explain that they wanted to really get down to work and focus on a new record before returning to the road once again in 2014 at the latest. He also mentioned that he really wanted to perform songs that they had never played live before when they return to touring. In October 2013 the band were announced to be headlining the Out & Loud Festival in Geiselwind on 31 May 2014. On 18 October 2013 Hansi announced via a news post on the official website that he expected the new record to be fully produced and finished by May 2014. He mentioned that the production of the album was coming along well, and mentioned nine new songs by name (Irish Hill [now titled Grand Parade], Encrypted Time, Prophecies, Holy Grail, Winter's Coming, The Throne, The Ocean, and Outcast) and two other songs with presumably uncertain titles, Song 9 and Midtempo Song. The tenth Blind Guardian album, titled Beyond the Red Mirror, was released on 30 January 2015, its first single "Twilight of the Gods" having been released on 5 December 2014. On 28 January 2015, two days before the release of Beyond the Red Mirror, Blind Guardian announced on their official Facebook page that Barend Courbois is their new session/live bassist. They recorded live shows during the 2015 Beyond the Red Mirror U.S. tour for a new live album, Live Beyond the Spheres, which was released on 7 July 2017. When asked in July 2017 about the next Blind Guardian studio album, Kürsch stated, "We haven't done too much songwriting for the next regular Blind Guardian album, but still, we've made some steps at least, and I can sense a strong change in comparison to what we did on the last album. There's one song called 'Architect of Doom', which is a real heavy song. Very powerful. Very thrashy at points. And there's another song called 'American Goth', which is kind of what you would expect from Blind Guardian, but yet the way we maintained the drums, for example, the way we maintained the orchestra, and that is a song with orchestra, again, it's so different. I'm pretty sure that there will be a significant change when you listen to these two albums and from that point of view, yes, Live Beyond the Spheres is the end of an era." He also stated that they are working on an orchestral album, which was originally scheduled to be finished and released in 2016, but now due for release in 2019, followed by a "heavy album" to be released in 2020. Blind Guardian's first two albums, Battalions of Fear and Follow the Blind, were more in the style of speed metal than their following works. Beginning with their third album Tales from the Twilight World, Blind Guardian gradually began to write more complicated compositions focusing less on speed. As of their sixth album, Nightfall in Middle Earth, Hansi stopped playing bass to focus on singing. At this point the band began to incorporate large amounts of orchestral arrangements, and utilized the technique of overdubbing, heavily influenced by the English rock band Queen. Blind Guardian's music features the staccato guitars and double bass drumming characteristic of power metal, as well as the use of overdubs and numerous backing vocals to create a dense sound. This proved significant on all albums after the first two but most particularly on A Night at the Opera. 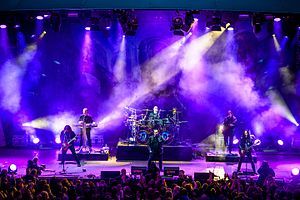 Another definitive feature of Blind Guardian music is frequent use of folk tunes and instruments, especially in power ballads such as "Lord of the Rings", "The Bard's Song", "A Past and Future Secret", "Skalds and Shadows" and "Curse My Name", among others. The band was initially inspired by their fellow countrymen Helloween, and in its early releases also showed some influence from Iron Maiden and Metallica. According to guitarist Marcus Siepen, during the songwriting for Follow the Blind, they also used to listen to Bay Area thrash metal bands, such as Testament and Forbidden, resulting in a somewhat heavier sound. Starting with their third album, Tales from the Twilight World, through Somewhere Far Beyond and Imaginations from the Other Side, Blind Guardian gradually incorporated more influences from progressive and classical music. Queen became a huge impact, in particular concerning the choir arrangements and harmonies, an effect most notable on A Night at the Opera. Singer Hansi Kürsch expressed the band's attraction to 1970s progressive rock, for example early Genesis, Gentle Giant, and ELP. However, with regard to the genre, he sees the more direct influences in progressive metal bands, in particular Fates Warning, Queensrÿche, and Savatage. The folklorist influences on Nightfall in Middle-Earth came mainly from British rock band Jethro Tull. Along with Jon Schaffer, the leader and founder of Iced Earth, Kürsch is a member of Demons and Wizards, where he is the lead singer. Frederik Ehkme was a founding member of the band Sinbreed, in which Marcus Siepen was a session member. Later on, during 2012, Marcus became a full member of the band. After the tsunami that struck Japan on 11 March 2011, Blind Guardian worked with their former record company, EMI Music, and auctioned off an exclusive studio session for two in the Twilight Hall Studio in Grefrath, Germany for charity. All of the proceeds were donated to the tsunami relief efforts. The auction ended on 22 April 2011 with a final bid of £1,171.00. In 2019, the Power/comedy metal band Nanowar of Steel released the song "The Quest For Carrefour", openly inspired to the style of the Bards. ^ Blind Guardian. "Band: How it started..." Archived from the original on June 30, 2007. Retrieved 2007-07-15. ^ "No Life Till Metal". Nolifetilmetal.com. Retrieved 2011-07-15. ^ "Lucifer's Heritage on MusicMight". Musicmight.com. Archived from the original on August 29, 2011. Retrieved August 2, 2012. ^ "Band". Blind-guardian.com. Retrieved November 25, 2017. ^ "Battalions of Fear Review". Metalstorm.ee. Retrieved 2008-02-17. ^ "Metalkings.com". Metalkings.ru. Retrieved 2011-07-15. ^ "Follow the Blind Review". Soundofmetal.se. Retrieved 2008-02-17. ^ "Nightfall in Middle-Earth Review". Retrieved 2008-02-17. ^ "A Night at the Opera Review". AllMusic. Retrieved 2008-02-17. ^ "Various Artists – In the Name of the King. Soundtrack review". Imhotep.no. Retrieved 2011-07-15. ^ "Harbinger of great things to come". Blind-guardian.com. Retrieved 2011-09-10. ^ "Blind Guardian – Update On New Orchestral Album". Metalstorm.net. Retrieved 2011-09-10. ^ "Film score metal band Rhapsody Of Fire announces new bass player". Rhapsodyoffire.com. 2011-09-01. Archived from the original on 2013-03-27. Retrieved 2014-06-05. ^ "Nuclear Blast's "Memories of a Time to Come" page". Nuclearblast.de. Archived from the original on October 13, 2011. Retrieved 2011-10-12. ^ "A Traveler's Guide to Space and Time coming in February 2013". Blind-guardian.com. ^ "Where do we go from here?". Blind-guardian.com. Retrieved 2012-07-31. ^ "A sign of hope..." Blind-guardian.com. Retrieved 2013-10-20. ^ "Blind Guardian To Release 'Twilight Of The Gods' Single In December; New Album Due In January". Blabbermouth.net. 2014-10-10. Retrieved 2014-10-10. ^ "Introducing our new bass player Barend Courbois". Facebook.com. 2014-10-10. Retrieved 2015-01-28. ^ "BLIND GUARDIAN To Release 'Live Beyond The Spheres' Concert Album In July". blabbermouth.net. May 8, 2017. Retrieved April 7, 2018. ^ "Blind Guardian Discuss 'Beyond the Red Mirror,' Reveal New Orchestral Project". exclaim.ca. Retrieved 2015-12-29. ^ "BLIND GUARDIAN Frontman Talks Next Studio Album, Says 'Live Beyond The Spheres' Is 'The End Of An Era'". Blabbermouth.net. July 27, 2017. Retrieved July 28, 2017. ^ "Queen influence". Blind Guardian official site. Archived from the original on June 26, 2007. ^ a b c d "Markus Siepen Interview". Metalkings.com. Retrieved 2015-03-07. ^ "Blind Guardian's music perseveres through many different eras". Powerlinemag.com/. Retrieved 2015-03-07. ^ "Build a better Bard's Song and help Japan". Blind-guardian.com. Retrieved May 2, 2011. ^ "EMI Music Exclusive Studio Session with Blind Guardian". Cgi.ebay.co.uk. Retrieved May 2, 2011. Wikimedia Commons has media related to Blind Guardian.